The Lagos Trophy is a dinghy team racing event taking place at Army Inshore Sail Training Centre (South), Thorney Island on 25th to 27th of June 2019 for all Regts and Corps in the Army. FAQ – WHAT IS TEAM RACING? A Sailing format in which a team of sailors work together to try and establish an overall winning combination for their team over their opposition. 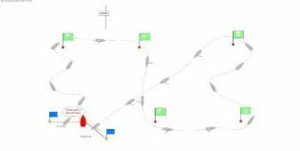 Team races are fast and furious and reward good starting, boat speed, boat handling, rules knowledge and team work skills. Team racing can be done with 2, 3 or even 4 boats per team with 3-boat team racing being the most common type. The scoring system is the same as fleet racing with one point for first, two for second and so on, and team with the lowest total number of points wins. For example, if the ASA Team raced the RNSA and finished with boats in 1st, 4th and 5th they would have a total of 10 points, whereas the RNSA would have a total of 11 points (2nd, 3rd and 6th) so the ASA team would have won. In 3 boat team racing any score-line with 10 points or less wins.